Opening: Friday 2 November at 6 p.m. The outstanding Catalan philosopher and theologian Ramon Llull (c.1232–1316) encourages us to reread the late Middle Ages. 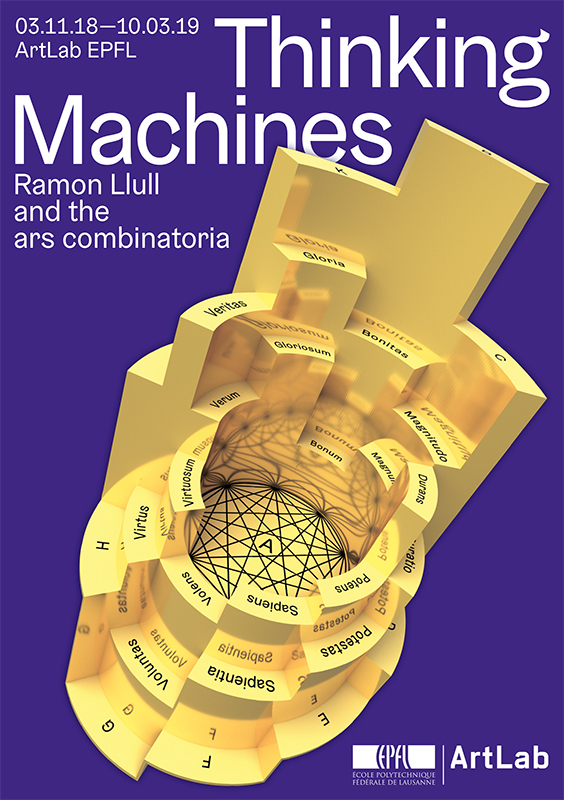 Llull, not only theoretically and linguistically invented a new method of knowledge acquisition, like an engineer, he also mechanized it, and translated it into a machine. Llull’s ars combinatoria was a method based on divine intuition for generating truths by means of a logical algebraic language.The method Llull invented was universal in its aspiration and, introduced a modern way of learning. It postulated the unity of the various disciplines of knowledge of his day, and through deduction, argumentation, and dialogue. The reverberations of Lullian thought on technology, art and culture find their present-day corollary in a pedagogical revolution which has “computational thinking” at its core. In “Thinking Machines” the realms of poetry, literature and art meet those of humanities and scientific research. The drivers that brings this polymath, thinker, philosopher to the EPFL, demonstrate the extent to which Ramon Llull’s investigations and prolific production are of profound relevance for our contemporaneity. Re-curated with the ZKM (Center for Art and Media Karlsruhe). This exhibition was originally conceived at the CCCB (Centre de Cultura Contemporània de Barcelona).